Broken Hill may be a town associated with blue singlets and heavy-drinking miners, but in 1932 the local citizens knew how to celebrate Christmas in style. The following article appeared in the Barrier Miner on the Wednesday after Christmas. The grand repast started with a seafood cocktail and concluded with community singing and a plumb pudding worthy of a toast. What spiced imaginings are conjured up by the mere mentioning of the Christmas Feast! The day that is honoured throughout the British Empire by eatin’ and not by thinkin’! And if we Australians are supposed to have appetites which are the envy of the whole world, then surely there was never a more delightful excuse for indulging them than that which was set before us at the Grand Hotel last Sunday. The Combined Seafood Cocktail, opening the menu, made one wonder just to what peak of perfection the dinner would rise. To the strains of music came green turtle soup, Spanish olives, devilled almonds, fried fillet of Murray cod garnished with lemon, supreme of Maryland chicken, for as in fashion, home making, or politics, there was no standstill in this subject of food. And the tide of hospitality flowed on through roast ribs of beef, suckling pig with sage dressing or apple snow sauce. On slices of pineapple ham was roast tom turkey (so young it was scarcely out of its swaddling clothes). Iced asparagus with vinaigrette sauce, baked tomatoes, green peas, golden potatoes and golden days. At the risk of being tedious let me explain that golden days was not a dish conjured up by the active brain of our host or hostess, Mr. and Mrs. Melville. Oh no! It was something more exquisite still! ‘Twas a vocal number from “The Student Prince”, and standing upon an improvised platform, to wit, the seat of his chair, rendered wid a smoile tutti vociferando by Mr. J. J. Davoren. ‘Tis a difficult and foredoomed endeavour to attempt to pick in cold blood the most perfect dish from that menu; but the Christmas pudding was something that owed its life to only a hundred per cent chef. Dark with plums, rich with raisins and spices, I must leave it to the imagination of experts to complete the dish. Followed frozen fruit sundae, Burgundy trifle, sherry jelly, strawberry ice cream, Chilvern cheese, fruit, nuts, black coffee – or delicious Mah Jongg tea. The feast was set forth in pomp of glass and silver. Dainty Christmas bells nodded welcome to a hundred guests, and Christmas bush waved greetings from the tables. Delightful music was rendered throughout the dinner by those two artists Mr. Jack Williams and Mr. Eli Wayland. Champagne corks popped ever and anon, and toasts were honored with friends all over the room. Quietly and unobtrusively Mr. and Mrs. Melville had created the atmosphere of a “home away from home.” Ladies in their newest summer frocks, men in cool greys and browns, moved from table to table, exchanging greetings and good wishes as if all belonged to one large family, members of which had not met for a year. In her unique, sweet voice, Mrs. Cotton sang “To a Miniature”, “Bonny Mary of Argyle” and “Danny Boy”. The orchestra, inspired with the happy home atmosphere, played popular airs, and the guests spontaneously joined in community singing. Interspersed with the vocal choruses toasts were again honored. Mr. Voss Smith and Mr. J. J. Davoren spoke of the appreciation of the guests of the delightful atmosphere, the service and the appointments provided by Mr. and Mrs. Melville, and a toast to them was popularly honored. 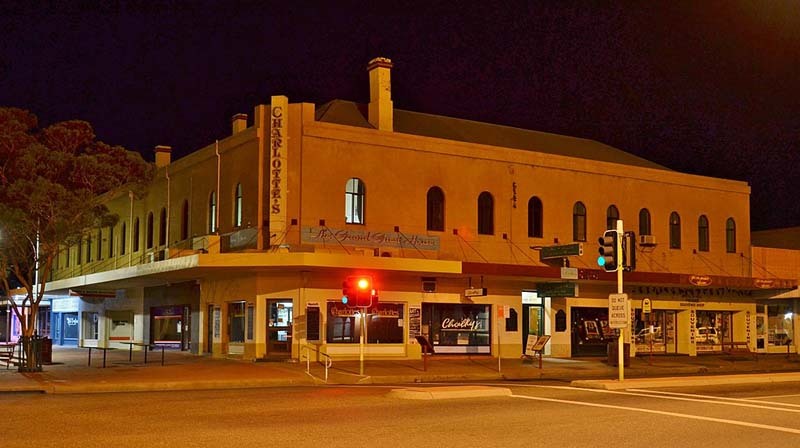 Followed – “For They are Jolly Good Fellows,” and “Auld Lang Syne.” Mr. Melville responded suitably, saying it was his pleasure to cater for the public of Broken Hill and modestly gave his staff the whole credit of the dinner. A toast to the visitors was responded to by Mr. Stratton. Various guests spoke eloquently of the dinner party, and the plum pudding got a special toast. Maybe they were loath to leave the fascinating atmosphere, maybe ‘twas that much feasting meant little activity. Whatever it was, in humor to forgive anyone, even relations, the guests lingered on, expressing the spirit of pleasure, singing Christmas carols, mixing good sense with good nonsense and proving that age has not withered the custom nor staled the infinite variety of celebrating Christmas. Alas, the Grand Hotel is no longer what it was. Built in 1888, it was delicensed in 1959. The beautiful old verandahs have been removed and the establishment now operates as The Grand Guest House.